I have partnered with Jennie-O this year to bring you lots of yummy recipes featuring Jennie-O turkey. I repeat, LAST DAY OF SCHOOL! Omg, you guys. I have never been excited for the last day of school. 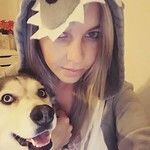 I have had a year and I am ready for 3 months of fun. I’m gonna swim in all the pools, I’m gonna sleep stupid late every day, I’m gonna have ice cream every night, and I’m gonna eat all the burgers. I tend to choose turkey over beef when it comes to burgers. Less calories, less fat = more cheese on top. 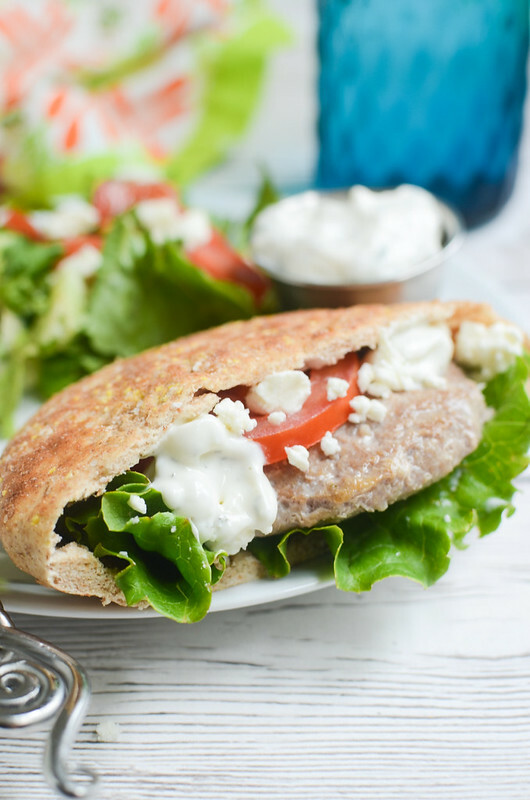 My favorite way to do turkey burgers is with the Jennie-O Lean Seasoned Turkey Burgers. They’re already portioned out and shaped AND seasoned with a bit of onion and garlic. So it saves you a lot of time, especially if you’re cooking up a bunch. When I want to add a bunch of stuff to the burger itself, I go for the Jennie-O 93/7 Lean Ground Turkey. It’s lean but not so lean that it’s going to get dry on you. Speaking of dry turkey burgers, let’s talk tips. Because it really is easy to dry out a burger if you aren’t careful. First up, don’t keep flipping the burger! Just leave it alone! For the turkey burgers, I start with 9 minutes on each side and then use a meat thermometer to check for doneness. If it’s not at 165F, I let it go a few more minutes. But don’t keep flipping it back and forth! Don’t squish your burgers with the spatula while they’re cooking. You’re squeezing all the juices out when you do that. If you want to add a little extra moisture to your meat mixture, a couple tablespoons of olive oil or some sauteed onions will do the trick. And finally, let your burgers rest for a few minutes before you serve them up. It allows all the juices to redistribute and get delicious and stuff. So for these, I used those Jennie-O Lean Seasoned Turkey Burgers that I love so much. I cooked up some of those, tossed them in some split pitas with lettuce, tomato, and red onion. And then sprinkled some feta on top. 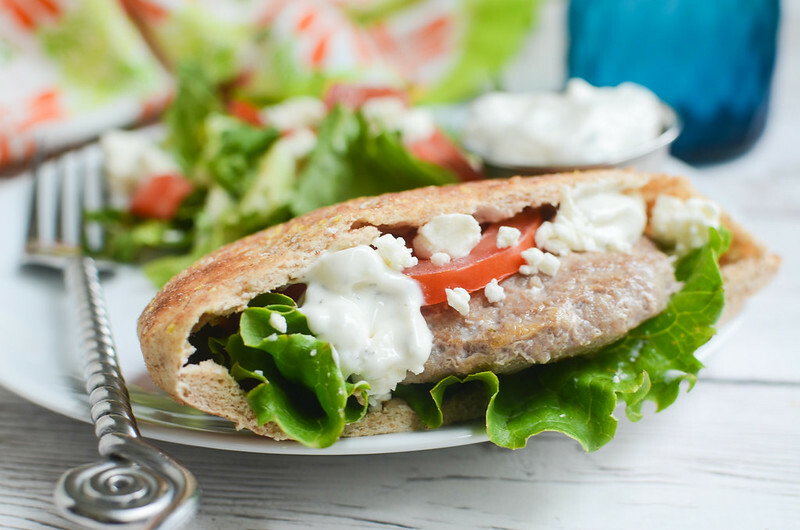 Plus, a healthy drizzle of homemade tzatziki sauce. I’m addicted to tzatziki sauce. But tzatziki sauce is one of the greatest things on earth. 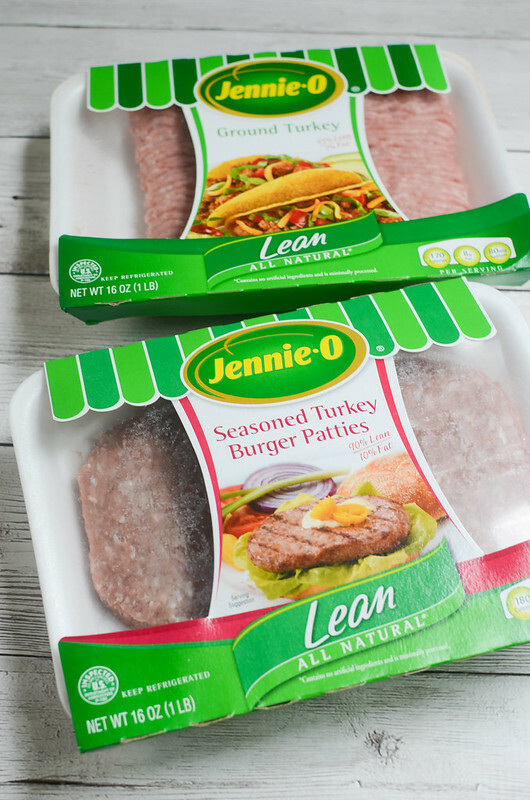 Before you head to the store for your turkey, be sure to print out the $1 off Jennie-O Frozen Turkey Burgers coupon! To make the tzatziki sauce, stir together all ingredients. Refrigerate for at least an hour before serving. Grill the Jennie-O Seasoned Turkey Burger Patties for 9 minutes on each side or until the internal temperature is 165F. Set the patties aside to rest for a few minutes before serving. Layer the lettuce, tomatoes, and red onion inside the split pitas. 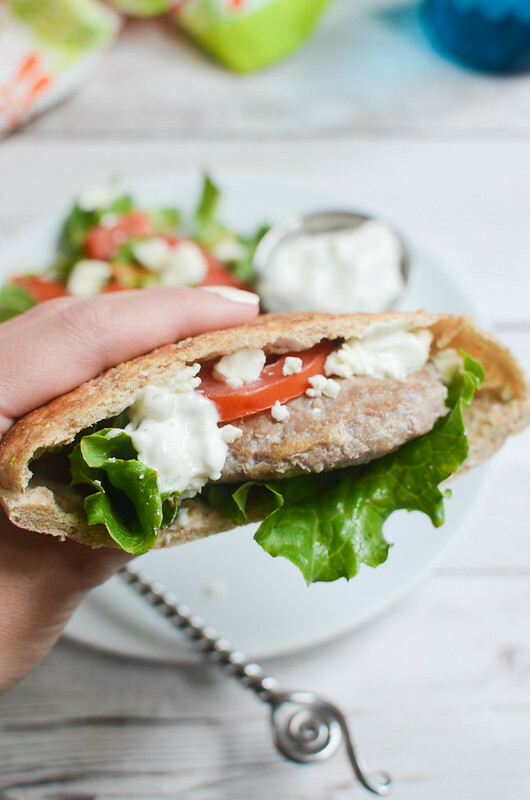 Top with a turkey burger and sprinkle with feta. Drizzle with the tzatziki sauce.